Navigate to Advisor Portal > Assumptions to review and update asset return assumptions. Below are some historical index return data to reference as you are setting your returns. 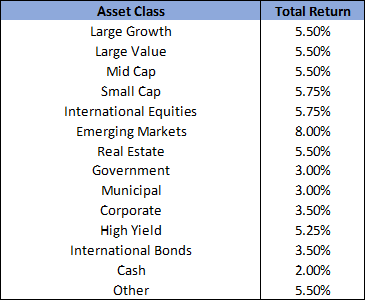 For equity asset classes, RightCapital provides the last 50 years of return data. For indices that do not have 50 years of data, RightCapital provides data back to the earliest date that the index is available. For fixed income data RightCapital provides the last 20 years of data (as many of these indices do not have 50 years of data). Please review the data below or use your own historical data to set your return assumptions. Many financial institutions provide forward looking return assumptions. Below is summary information from JP Morgan's Long Term Capital Market Assumptions. You can review the detailed JP Morgan report here ↗️. There are also other financial institutions that provide long term capital market assumptions. Creating your own asset return assumptions is easy! Just click on the field to modify and enter a new number that reflects your advising philosophy. As a bonus, RightCapital provides complete control over Inflation assumptions, real estate transaction costs, and assumptions around the costs associated with the death of a loved one. It is very important to set your return assumptions for your clients and review these assumptions on a periodic basis. Using historical data to set return assumption provides a systematic approach to factor in the historical experience data into your financial projection. Using a forward looking approach allows you to incorporate more subjectivity into the projection. For previous default assumptions, please click here. How do I know what rate of return is assumed in my client's plan? Adjust the growth rate by choosing a different model. Alternately, reach out to our support team or your sales associate to learn how you can build your own custom asset classes — control the standard deviation and rate of return! How do I transition allocation percentages over time? Rather than break out different allocations pre- and post-retirement, RightCapital has the option of using a glide path as an approach to adjusting the client's investments over time. See more details on the glide path here.